Are WOMADelaide and the Adelaide Fringe Losing Their Soul? Writer Michael Coghlan Ponders This Question. A couple of weeks ago English comedian Alexis Dubus begrudgingly conceded that he was done with the Adelaide Fringe. He had watched it change into something that no longer met his needs and he no longer wanted to be part of it. At the risk of starting a bandwagon I may have reached the same point with WOMADelaide. And for a veteran who has seen all but one of them and who often said that ‘WOMADelaide is my religion’ this is no small matter. If I did nothing else each year, I always attended this that was the greatest show on earth. I saw things at WOMADelaide this year that I have never experienced before. Bins were often overflowing with rubbish, stages were named after sponsors, and technical stage problems were common. I can’t be sure but it seems that the only explanation for the technical glitches is that new crew were involved. Novatech? I heard more feedback in the first three days of the festival than I’d heard for the last 10 years. WOMADelaide had raised the bar in many areas, and one of those areas was stage management. Feedback just never happened. When performers were unable to hear themselves in the foldback, it was sorted within 30 seconds or so of a performance getting underway. The sound crews were slick and professional. For some reason this year that standard was let drop and it was sad and embarrassing. But the main reason for my doubts about whether I’ll attend WOMADelaide again are based upon the music and programming. There is no doubt that over the years the program has been changing incrementally in favour of acts that are essentially bands, and mainstream acts like The Violent Femmes because they pull large crowds. These kinds of acts are primarily designed to get people up and dancing. The D in WOMAD stands for dance, so that’s fine, but it’s about the percentage of these high voltage acts that are now crowding the program. I’m a WOMADelaide purist. What first attracted me to the festival was the truly exotic – Russia’s Terem Quartet, a lone kora player from Africa, throat singing from Sardinia, Madagascar’s Justin Vali Trio – music you would never hear anywhere else, and where you felt extraordinarily privileged to witness things you otherwise had no access to. Mostly these musical events happened on the small stages where you had the opportunity of a more intimate musical experience. Adelaide music magazine editor and critic Robert Dunstan once wrote “as I stood among the Moreton Bay fig trees with the sun going down listening to Nusrat Fateh Ali Khan, I found myself thinking ‘I have never been happier’.” These kinds of intimate and exotic musical experiences at WOMADelaide can still happen, but they’re getting harder to find. The bulk of the program now features what I have taken to calling ‘global funk’. It matters not where the performers come from – Africa, Europe, Latin America, or their Australian based derivatives – all of these bands have percussion and electric guitars, and after a few songs in desultory recognition of their origins, they descend into a frenetic version of global funk played at loud volume and high speed. (It’s interesting at these moments to close your eyes and see if you can pick where the players come from.) It is music designed to whip up dance frenzies and the masses dutifully oblige. But WOMADelaide diehards like me keep seeking that magical moment on the smaller stages where I hear something that I’ve never heard before, and that challenges my musical horizons. And after this year’s event I realised that it is no longer worth the money or the four days trying to find those magical exotic moments. There are too few of them. 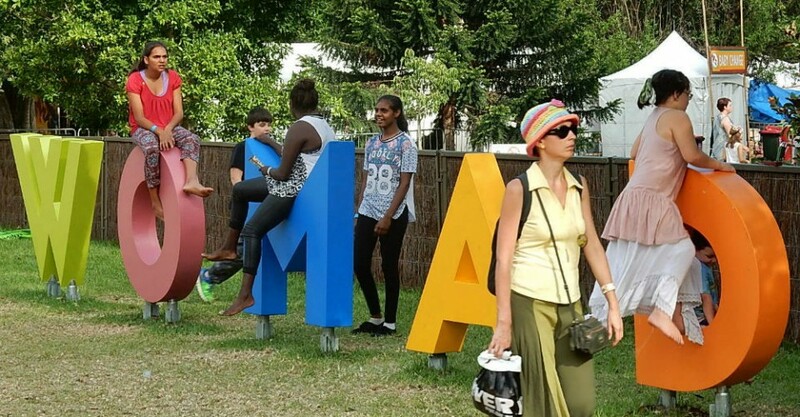 WOMADelaide has gone mainstream. It is now mostly about high energy and frantic rhythms. I can accept that things must change. It has been 24 years after all and nothing stays the same. I understand the need to change the programming to attract new audiences. And organisers would be foolish to continue to cater for the original Boomer types who were there at the beginning because we are beginning to disappear! There is some sadness in the realisation that it may be all over for me and WOMADelaide, but there’s a realistic acceptance too that the beast I fell in love with has changed. As it had to. I am enormously grateful to have had 22 years of musical wonderment. It was an organic experience that WOMADelaide performers frequently commented on, but it is now more about heaving masses and loud electronic rhythms. In this quest to attract greater crowds WOMADelaide has become more commercial. What was a highly innovative and exotic experience now threatens to sound and feel like ‘just another festival.’ It was more than that once. It has lost its innovative edge. And so back to Alex Dubus and the Adelaide Fringe. He is saying similar things about the Fringe and that in fact it is fringe no more. It too has caved in to featuring many mainstream acts to bring in the crowds and the strategy has worked. Again in 2016 it was bigger than ever. But perhaps bigger is not best. It seems that perhaps both the Adelaide Fringe and WOMADelaide have lost their ‘fringe feel’ in the quest for larger crowds. They have drifted away from the core mission that initially inspired them. Of course there is still evidence of ‘cutting edge’ acts in both festivals, but it’s about percentages and the truly fringe acts out there on the creative margins are being squeezed out by established artists and bands with bigger sounds. Perhaps it’s time for the artistic directors of these two events to get together and discuss where these festivals are heading. They are both still wonderful events, but they are changing and are being threatened by commercial imperatives. A conversation about their artistic soul and raison d’etre is needed. Otherwise we may soon be attending the [insert major sponsor] WOMADelaide festival where every stage has a named sponsor. Disclaimer: The opinions contained in this article are solely that of the author and does not necessarily reflect those of The Clothesline or its associates. Image courtesy of Michael Coghlan.